We first saw the structural footprint of House Unit 1, the largest house in the Pyramid Town for now, during the large-scale Western Town ‘scrape and plan’ season in 2004. Team members call it “Yuki’s House” but the unit is actually much larger than my apartment: the extent is about 25.0 m E-W and 16.0 m N-S covering an area of 400 m2. 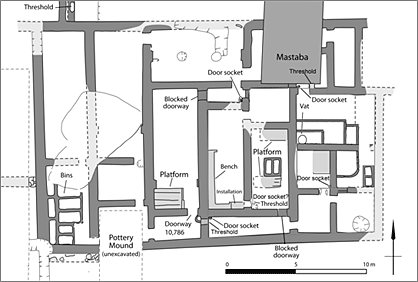 To date, we ascertained that the unit consists of at least 21 rooms including a bedchamber in the center, storage for the distinctive beer jars and an L-shaped bench, a series of bins in the southwest corner, and industrial area for bread and/or beer production in the east. In the 2011 season, we are focused on excavations at the eastern end of House Unit 1, the “industrial area,” which is markedly different in content, character and function to the rest of the building. We presume the area was either a bakery or brewery (or both functioning together) but the nature of this industrial area has yet to be determined. Brewery in the Pyramid Town? 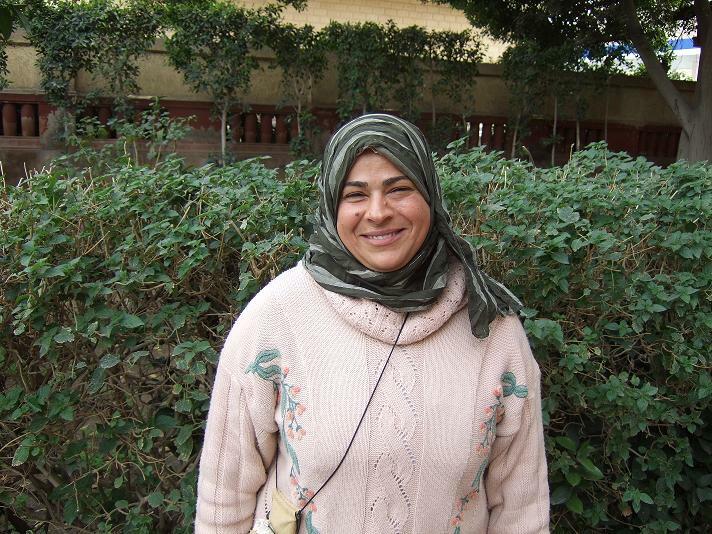 Afaf Wahba has worked for the Supreme Council of Antiquities for nine years. She began as a curator at the Coptic Museum in old Cairo and for the past two years, she’s been an inspector at the Central Department of Giza. This job does not usually entail field work, but that did not stop Afaf from dreaming about it. 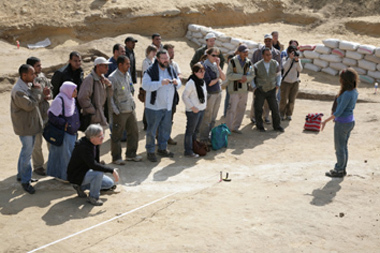 Afaf heard about the AERA/ARCE Field School in 2006. A colleague encouraged her to apply. Afaf Wahba at the AERA residence. One week before the application deadline, a friend sent her the application and insisted she apply. Despite the late date, she got an interview and was accepted into the Advanced Field School. She was determined to excel. Anubis was the ancient Egyptian god of embalming. He is often pictured on tomb walls attending to the deceased during mummification. The inspiration for the god’s identity probably came from the wild dogs that roamed the ancient cemeteries. 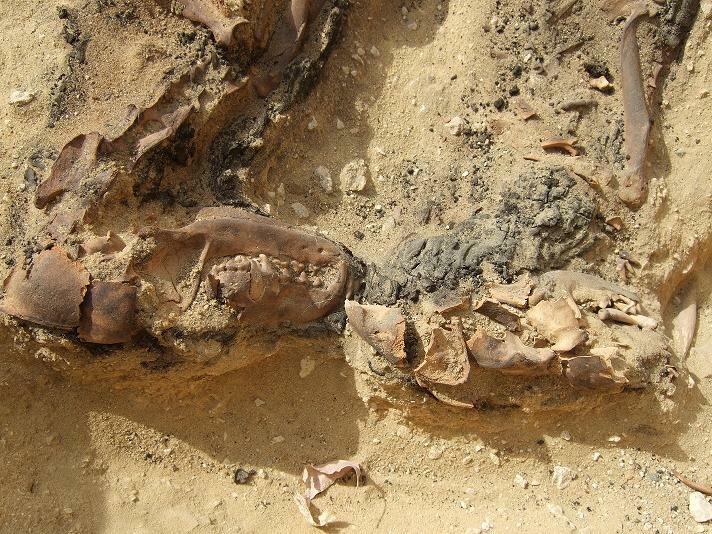 The AERA osteo team uncovered a Late Period (747-525 BC) burial this week with five well-preserved canines. They are actually better preserved than many of the Late Period human burials. These are not the first Late Period animal mummies (if we can call them that; they appear to be mummified) but they are the first from the cemetery at the Lost City of the Pyramids. Experienced as the diggers here are, the dogs generated quite a bit of excitement on the team. Animals were often used as votives in late antiquity Egypt, objects given in dedication to a specific god or goddess. 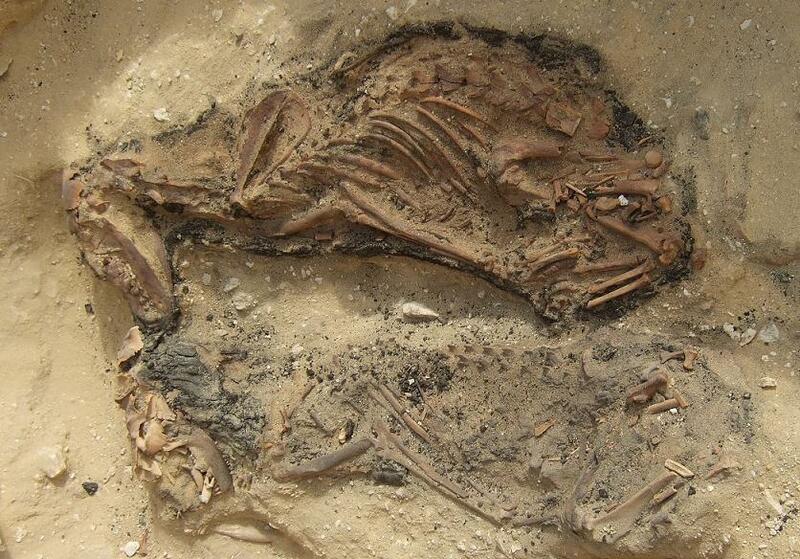 There are huge animal cemeteries containing mummies of ibises, cats, and other animals such as those at Saqqara. Detail view of the canine’s spines, craniums, and canines. With her blond, surfer-girl looks and vernacular, it would be easy to mistake Jessica Kaiser for just another cute denizen of the California beach … until she starts talking osteo-archaeology. Jessica directing field school students. 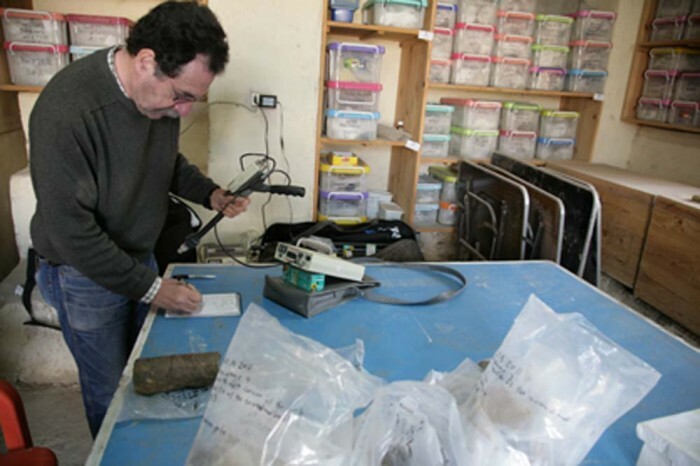 Osteo-archaeology is the archaeology of human and animal remains, particularly skeletal remains. 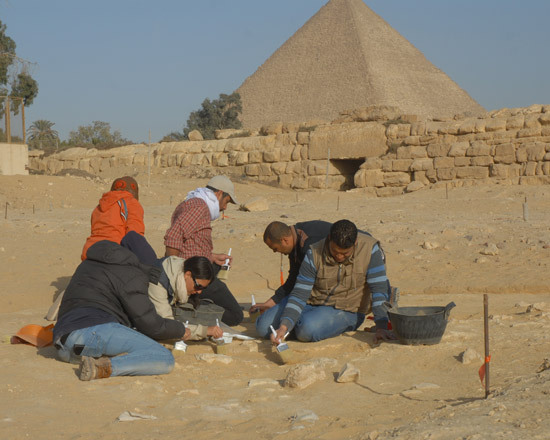 Jessica is completing her PhD based on her research of the Late Period (747-525 BC) burials that overlie the pyramid settlement at Giza. Born in Sweden, she lives in California and speaks flawless Californian, along with Swedish, Arabic, and other languages. Jessica wants to examine the origins and diet of the people buried in the LP cemetery. Were they from the area or were they buried here because Giza was a pilgrimage site? She also has done a typology of Late Period coffins. Whether tossing about Latin names for skeletal pathologies, warmly discussing her students, or relating a visit to the Egyptian coast, Jessica is always very animated. 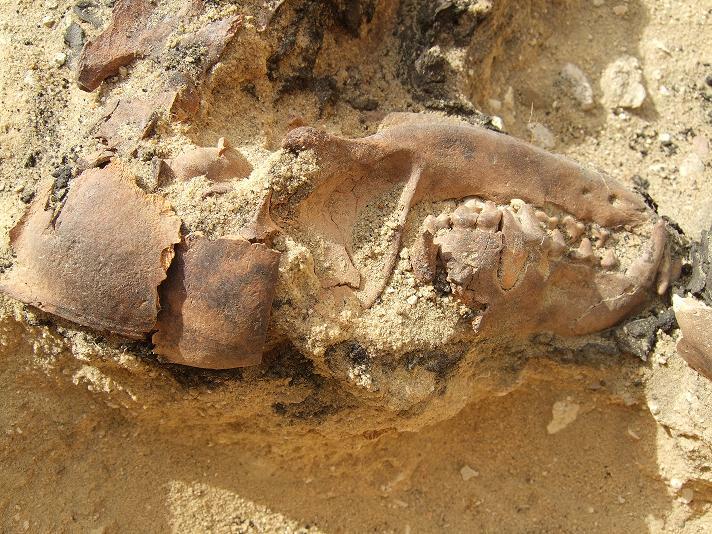 But she seems most passionate about two things: old bones and the AERA/ARCE Field School. Late Period canine burial at Giza.